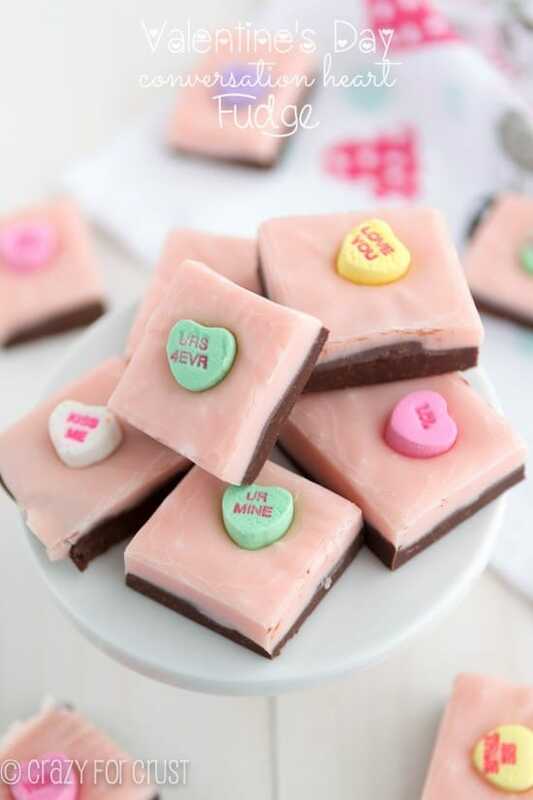 Valentine’s Day Fudge: guaranteed to make someone smile! Sometimes I really wish I was a man. (Well, besides during childbirth. That’s a given.) I envy men their ease of so many things in life. Like, say, party going. Shower. Pull t-shirt out of drawer. Decide on jeans vs. shorts. Finger-brush hair. Check teeth. Ready! Mentally make notes of small talk topics. Go over and over and over in head what to bring for dessert. Find out kind of wine they like. Spend 30 minutes at store staring at bottles. Dream of different scenarios (will they like me? will they think I’m boring? will I get food in my teeth?) all night long. Spend 30 minutes blowing out hair. Spend 30 minutes perusing clothing options. Will it be casual? Dressy casual? What’s safe? Get dressed. Notice hole in shirt. Spend 30 minutes figuring out how to thread a needle. Flat iron hair that gets fluffy after blow out. Make sure everyone wears socks without holes, in case it’s a “no shoes” house. Try not to have an anxiety attack. See the difference? Men have it so easy! It’s not fair. Men also don’t have to think up cute Valentine treats to give to kids, take to school, make for potlucks, and to post on the internet. Er, I guess that last one is my fault (job description). 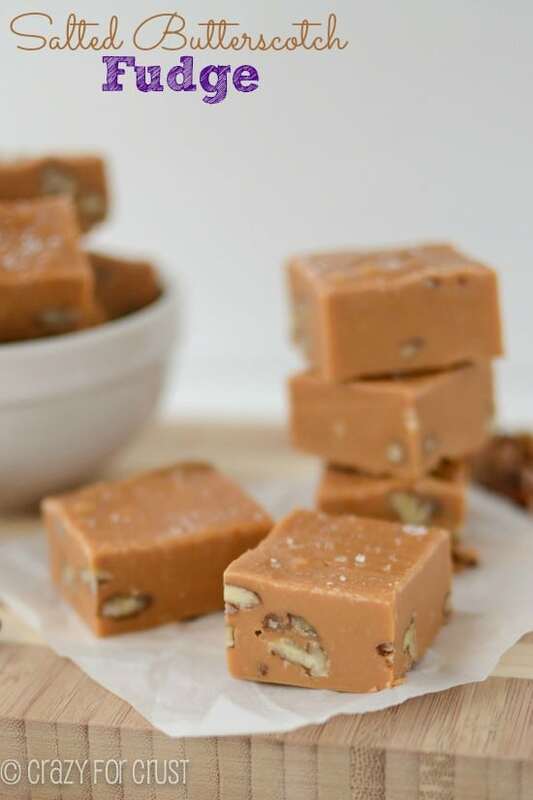 This fudge is one of the easier decisions you’ll make this Valentine’s Day: it’s easy, cute, and everyone will love it. Even the people you don’t know at that party. I made a layered fudge like this at Halloween, and y’all loved it, so I wanted to do it again for Valentine’s Day. Even though it’s layered and that does involve an extra couple of steps and an extra dish to wash, it’s still super easy. And, well, it’s fudge. With a cute conversation heart on top. And it’s part pink. Everyone will love it! That Halloween fudge was made using Halloween colored Nestle morsels, but I didn’t see any of those for Valentine’s Day. No matter; that’s what food coloring is for. The bottom layer is made of semi-sweet (or you can use milk) chocolate chips and fat-free sweetened condensed milk. You use half the can of SCM for each layer, which is about 5 ounces. The can says 14 ounces, but when you measure it out…it’s not. It’s just over 1/2 cup per layer. Once the chocolate layer is in the pan, you chill it about 30 minutes, so the pink layer won’t mix with it. The pink layer is the rest of the SCM mixed with white chocolate chips. At the end, when you add the vanilla extract, you add a few drops of red food coloring to give it the pink hue. Once you pour the pink layer on top the chocolate, you quickly place the conversation hearts in even rows on the top. Once it’s set you cut it into squares. My pink fudge layer was a little softer than normal, but it still set up. If you’re worried, just store it in the refrigerator (but mine has been on my counter for 4 days and is just fine). Tip: I used vanilla extract in my fudge, but you could totally add a little cherry or strawberry extract instead, to give the pink a flavor! 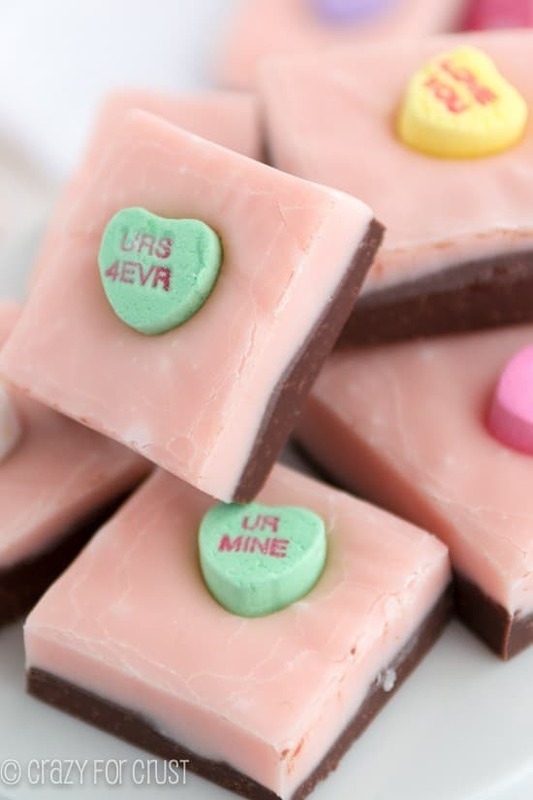 This fudge is the perfect gift to give this Valentine’s Day! It’s so cute you’ll get a smile from your sweetheart, I promise. 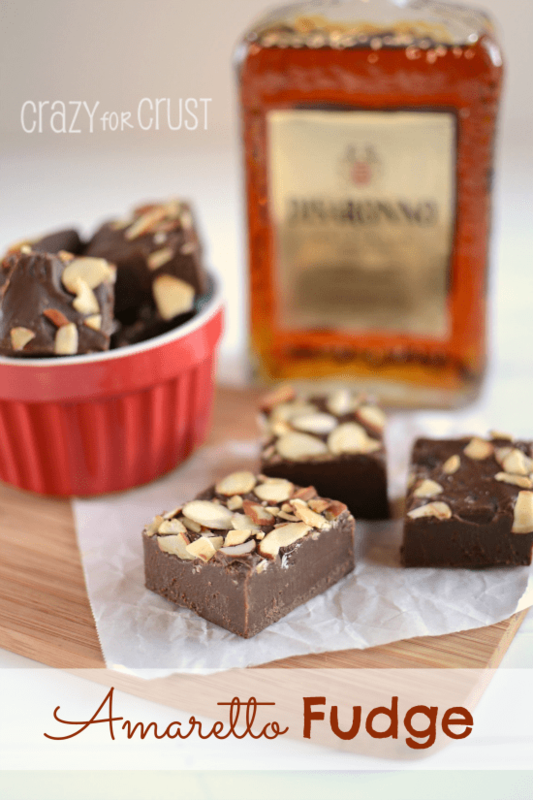 A layered fudge that's guaranteed to make someone smile! Line a 9x9” pan with foil and spray with cooking spray. Place chocolate chips and half the can of sweetened condensed milk (just over 1/2 cup) in a medium saucepan. Heat over medium-low heat, stirring constantly, until the mixture melts together and becomes smooth. Remove from heat and stir in 1/2 teaspoon vanilla extract and one pinch of salt. Quickly pour and spread in prepared pan. Chill for 30 minutes. When chilling is up, remove pan from refrigerator. Add white chocolate chips and remaining sweetened condensed milk to a clean medium saucepan. Heat over medium-low heat, stirring constantly, until the mixture melts together and becomes smooth. Remove from heat and stir in 1/2 teaspoon vanilla extract, one pinch of salt, and red food coloring (about 3-4 drops for a light pink). Quickly pour over chocolate layer and spread. Immediately top with conversation hearts in a 6 x 6 grid. Let cool to room temperature and then chill until set. Slice into squares (1 conversation heart per square) and serve. Note: depending on how equally you divide your SCM, one layer may be softer than the other. You may need to store this in the refrigerator. Hi! I featured your recipe in my Valentine’s on a Dime Dinner post! It’s linked up and credit included! Come check it out sometime! I just bought Spring chocolate morsels at the store. They are all the beautiful Spring colors and would be perfect for an Easter fudge! Can you use regular condensed milk and not fat-free sweetened condensed milk? You should be able too, yes. 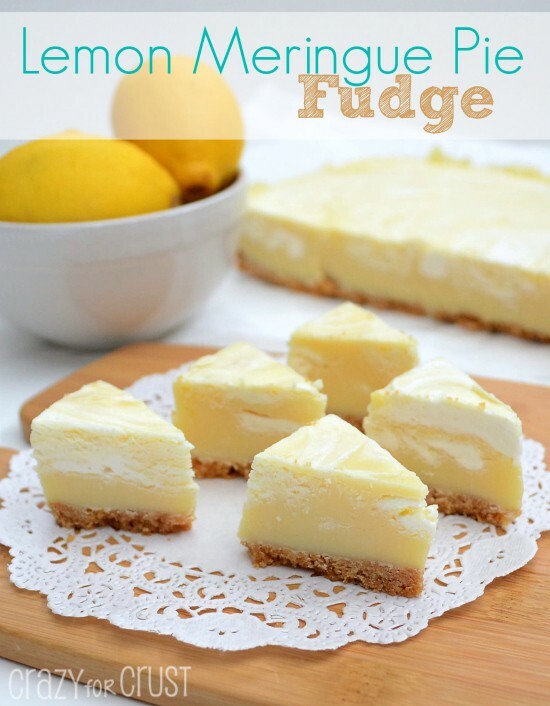 I just always use fat-free because the original easy fudge recipe came on that can!